The story of a man who was murdered by his own son, for refusing to sell his land and sponsor him abroad has been shared online. A Facebook user, with the name Eric Doncleaono has just shared the sad story of how his uncle was murdered by his own first son for refusing to sell his land to sponsor him abroad. 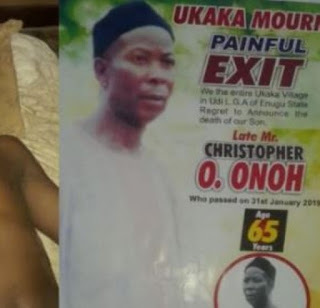 Christopher first son Chidiebere Onoh, a notorious cultist conspired with his friend Sir King n kill his dad, just bcos his dad refused to sell his land to send him abroad, having sold his late junior brother land and gave the wife and son the money. 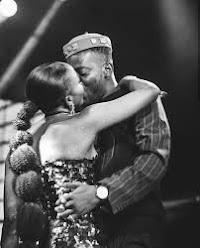 The two shared the money among themselves and the wife left her matrimonial home to live at Egede for ichaka business while the son moved to an unknown place. After they squandered the money, both came back and insist that Christopher must sell the land to send him abroad which he declined. Chidiebere and his friend Sir king conspired and kill Christopher with dog chain. This is Christopher corpse after he was killed in his parlour, they took the corpse to his bedroom and arrange him in his bed.